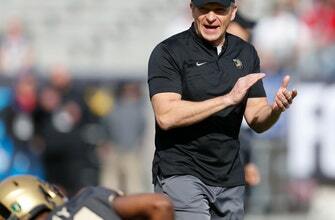 WEST POINT, N.Y. (AP) — Five years ago Jeff Monken faced a daunting challenge when he was hired at Army: Resurrect a program that had one winning season under six coaches over a 17-year span. Now he’s faced with a task that might be even more difficult. After three straight winning seasons, three consecutive victories against Navy and two outright Commander in Chief’s trophies, the Black Knights are trying to maintain their status as the nation’s best service academy football team. Last year’s team won a school-record 11 games and finished with its highest final ranking in the AP poll (No. 19) since 1958. “What we’ve done in past seasons has nothing to do with what this team will do,” Monken said as he prepared for Friday night’s Black and Gold game that ends spring ball. “This team will decide what they’d like to accomplish and then decide how hard they want to work towards those goals. Spring ball brought in the usual bunch of new faces, and there are some big holes to fill. The Black Knights have become accustomed to winning and expect an encore performance. Army starts next season Aug. 30 against Rice at Michie Stadium. Army’s stable of fullbacks was a big reason the Black Knights topped the nation in conversions on third (112 of 196) and fourth (31 of 36) down as well as time of possession (38 minutes). Gone are Darnell Woolfolk, Andy Davidson and Calen Holt, who combined for 1,474 yards and 16 TDs. Connor Slomka (324 yards rushing, 4.4 per carry) likely will assume the role of workhorse in place of Woolfolk. “There’s a lot of production there to replace, but we have the components and the guys that can do it,” said quarterback Kelvin Hopkins Jr., who averaged 84.7 yards rushing per game. Also gone is offensive lineman Bryce Holland, a big part of the offense’s success. Hopkins guided an attack that ranked second nationally in rushing last year (312.5 yards per game) and capped his junior season with a record-setting performance in the Armed Forces Bowl , rushing for five touchdowns in a 70-14 victory over Houston. He also took care of the ball — the offense lost just five fumbles and threw three interceptions. The eight turnovers were the second-fewest nationally. Last year’s team was undefeated at home and demonstrated it was special when it nearly beat Oklahoma on the road in late September , losing in overtime to one of the four teams that made it to the College Football Playoff. Army loses seven starters on defense, including linebackers Kenneth Brinson and James Nachtigal, who combined for 126 tackles, 14 sacks and seven forced fumbles on a unit that ranked eighth nationally (295.5 yards per game). The secondary remains a strong point with Elijah Riley and Jaylon McClinton, who combined for 109 tackles, 11.5 tackles behind the line of scrimmage and two interceptions. After Hopkins, the Black Knights are slim on experience at quarterback, and that’s a concern. Backup Cam Thomas decided to transfer in January.